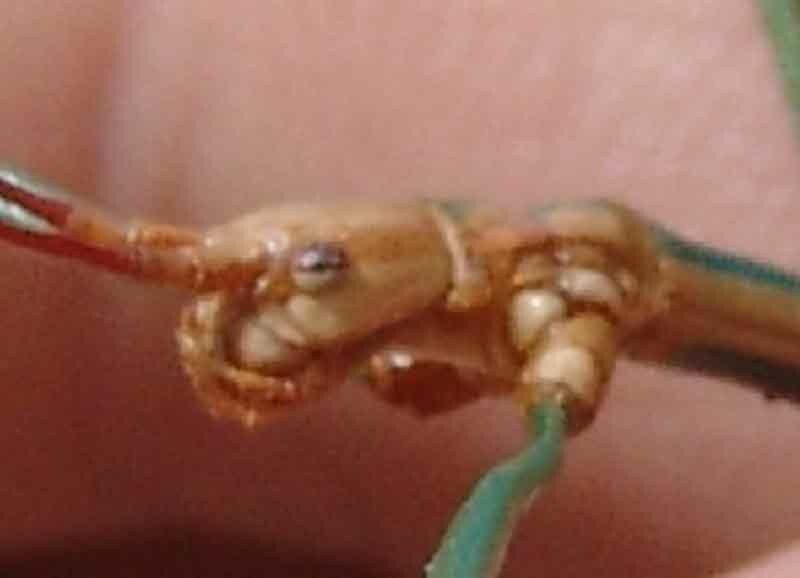 So-called "Leaf" and "Stick" insects are classed either as a suborder of the Orthoptera (the "straight-winged" insects -- referring to the parallel-sided structure of the front wings, including grasshoppers, crickets, mantids, cockroaches et al.) 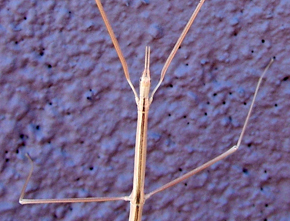 or, perhaps more likely, a sister group -- in any case one characterized by an elongated, slender, usually cylindrical body structure. 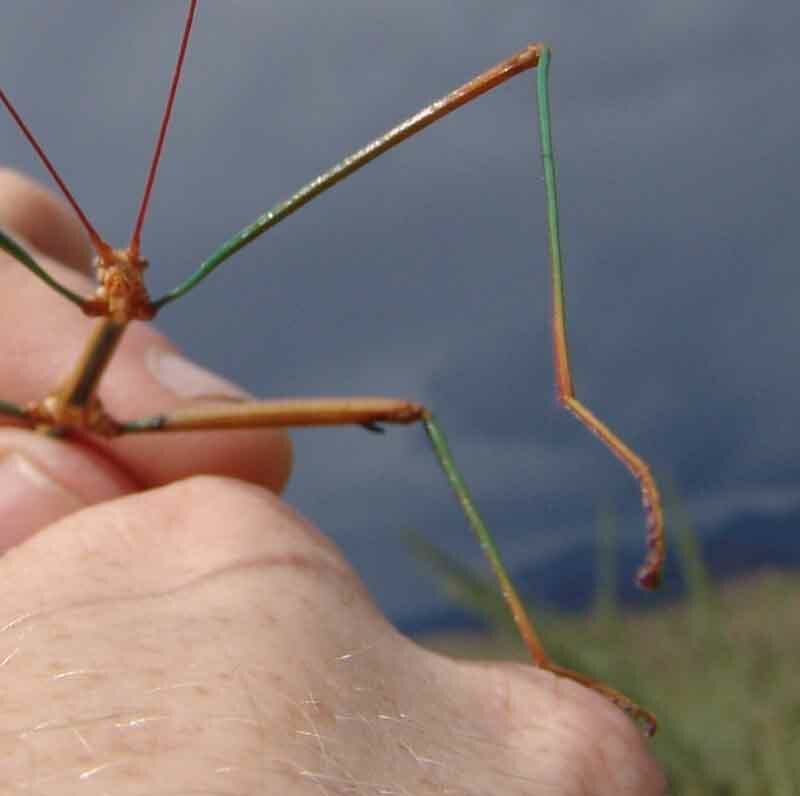 All of these creatures are herbivores, and the term "Phasmatid" refers to the usually cryptic body colors these creatures possess which (along with their bodily forms) make them resemble the vegetation on which they live ("phasma" means "phantom"). 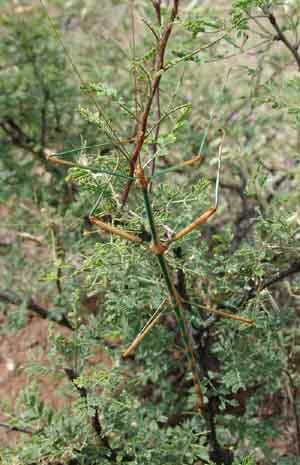 At left, we think this is a Diapheromera femorata (popular name "Common Walkingstick"), photographed near the Cow Camp in September 2006, attached to a Fairy Duster plant. 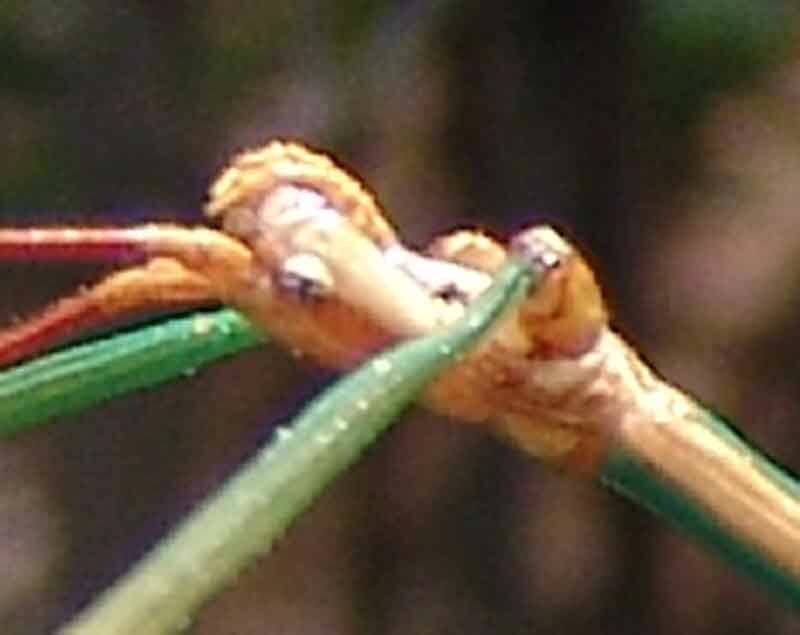 (click on the image to enlarge it.) Note especially the alternating green and wheat-colored leg and body sections of this specimen, which make the animal hard to see when it is grasping a green-leafed plant. 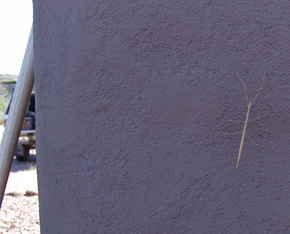 Walking Sticks are mainly active at night, and usually cling almost motionless to sticks and branches during the day. 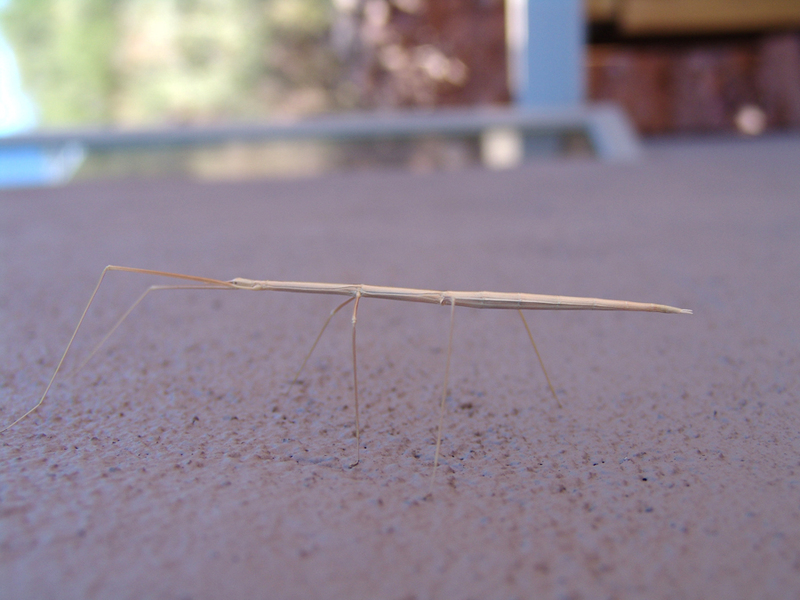 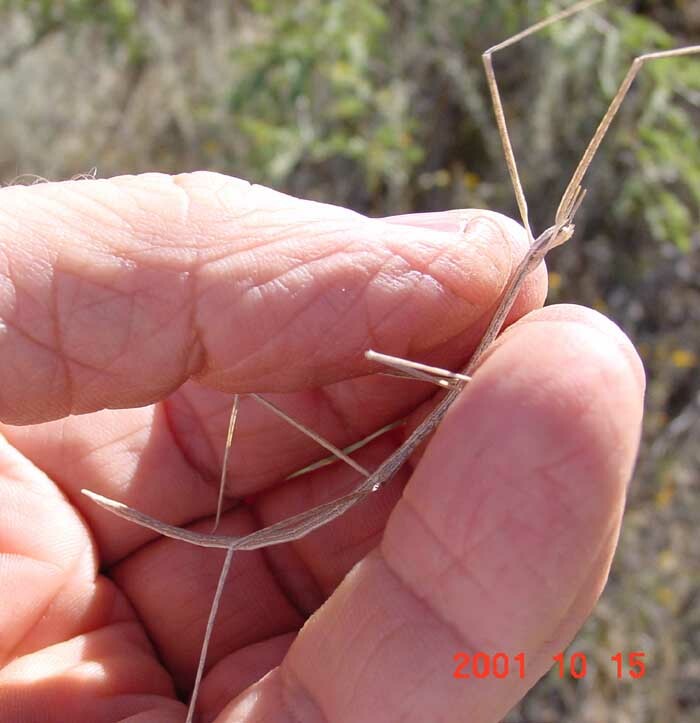 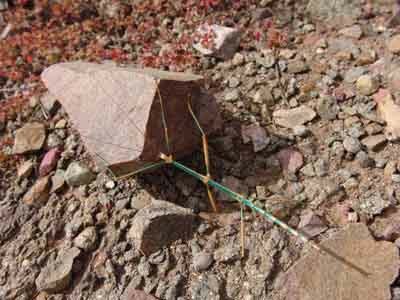 Walking Sticks tend to be large (the largest existing terrestrial arthropod is one of these species, having a documented specimen nearly two feet long), and their long legs have large lateral extensions adapted for walking. Mostly they are slow-moving insects, with reduced wings (functional only in males or lacking entirely). 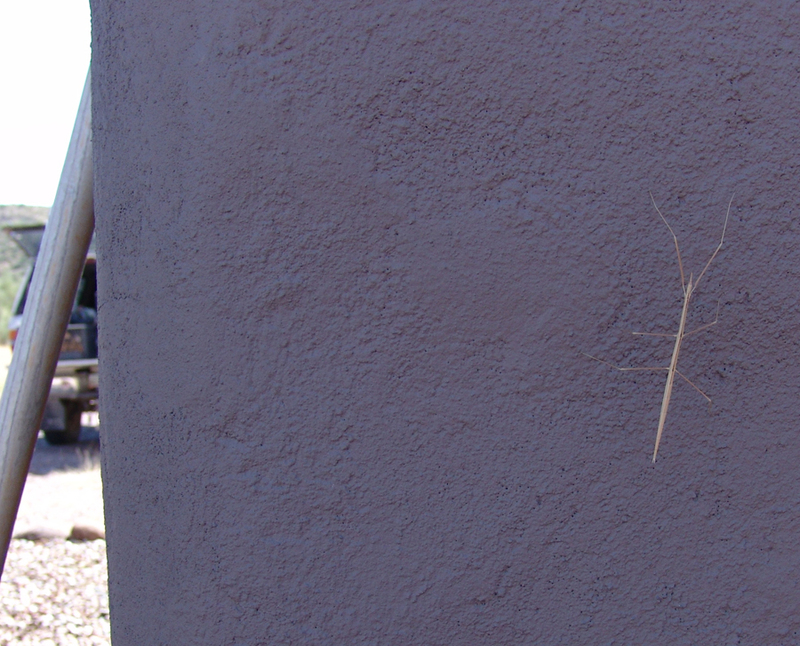 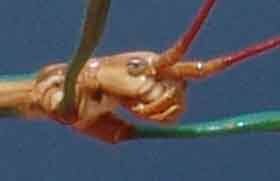 This one, a male, was not very large, but about 4 inches long not counting the very long antennae. 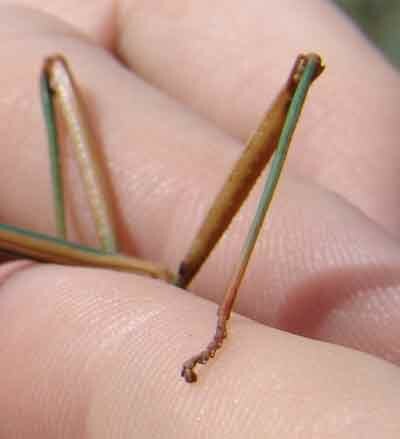 Males are generally smaller than females, and more gracile. Females in some species may reproduce by parthenogenesis. 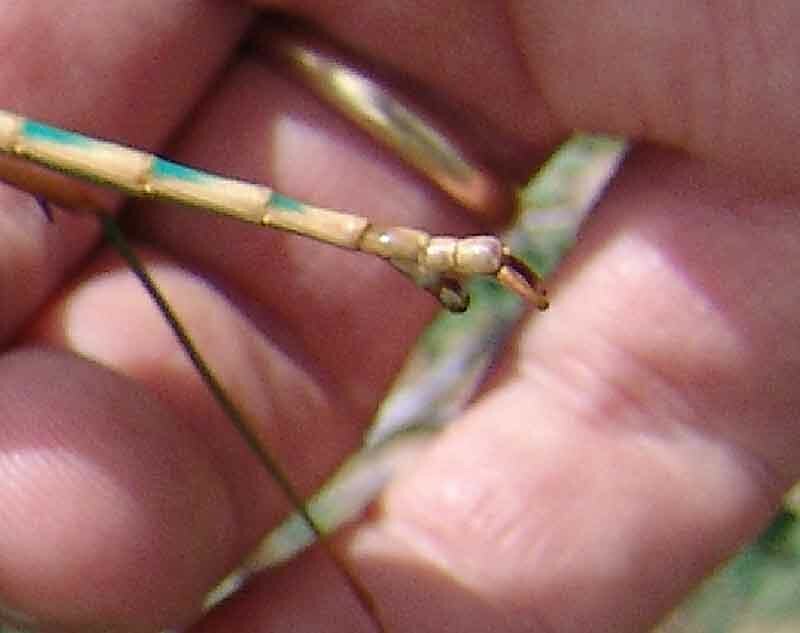 Their eggs are large, often seed-like, and many species drop their eggs singly on the ground, where eventually the nymphs hatch and crawl back up into the plants (they look and behave much like the adults, an example of "imperfect metamorphosis" in contrast to, e.g., butterflies or beetles). 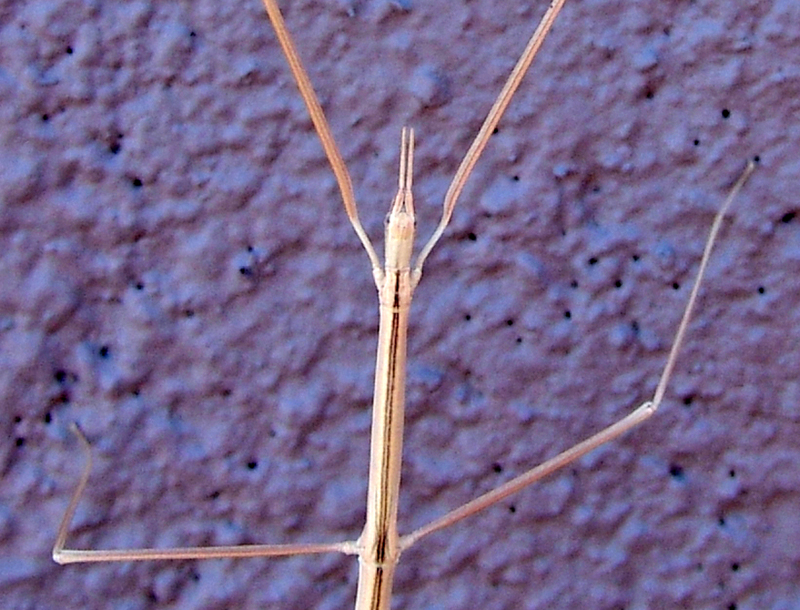 Judging by the extant fossil record, the Phasmatids are not a particularly ancient family, since the oldest known fossils date to 49-44 million years ago. 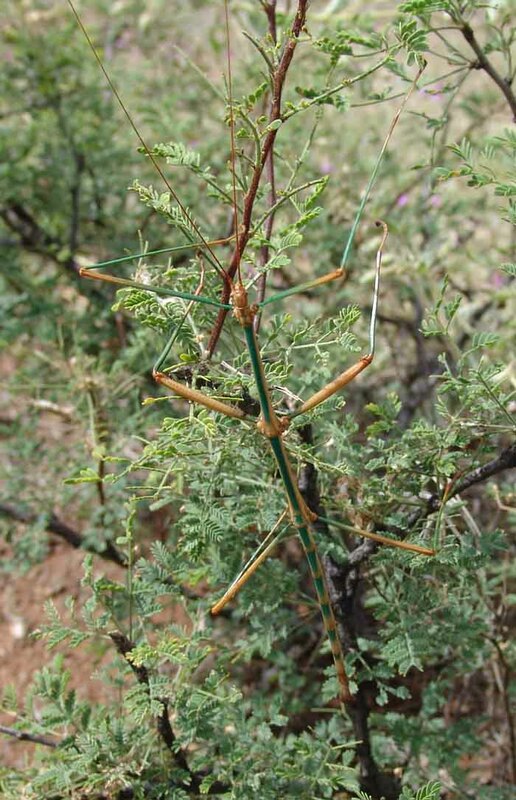 Since the living forms feed almost exclusively on the leaves of flowering plants (Angiosperms), it seems likely that the line evolved in response to the time when these plants became dominant during the late Cretaceous Era. 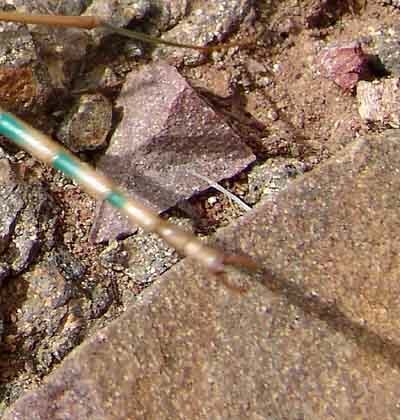 On October 9, 2010, we encountered this walker (which appears very similar to the one shown just above) on a house wall above lower Hot Springs Canyon.